We just added a new concept in Conferences i/o allowing administrators to create presenters and assign presenters to specific sessions. This new concept will allow Conferences i/o to add a wide breadth of useful functionality, particularly for panel discussions and sessions that have multiple speakers presenting. What can you do with Presenters? 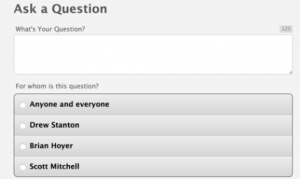 Create evaluation questions that are repeated for each presenter in a session. 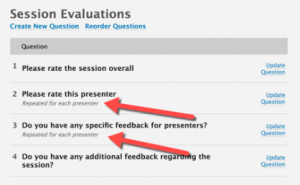 Attendees can now tag which presenter a question is targeted for before submitting. Attendees can search for sessions on your app using just a presenter’s name. Associate polls with presenters to keep track of whose polls belong to whom.